Hazed honey with a sticky and lasting white head. Aroma is phenolic and peppery with captivating notes of French Strisselspalt hops (herbs, flowers, honeysuckle, orange rind, persimmon). Lovely impression and depth to the nose, honey-ish and hay-like malt, noble hops, rustic yeast, which at first smells like the Blaugies strain but after some breathing it seems more like Thiriez with that rubbery phenolic note. Though the commercial description mentions brettanomyces, there’s no brett in the nose, and no signature tartness in the mouth, and if I were assessing this blind I would not say brett at all (no band aid/plastic, nothing “funky”, no tropical gum brett notes, none of that – this seems entirely sacc-derived). It’s medium bodied and succulent with an impressively silky and velvet-like mouthfeel, finishing lightly tart and strongly bitter with a lingering green and herbaceous hop note. It’s actually overly bitter for its sweetness and size but the effect isn’t ruinous. This is a top-tier hoppy Belgian-style Golden Ale that shows its Thiriez and Blaugies influence more than De la Senne / Saint Somewhere. 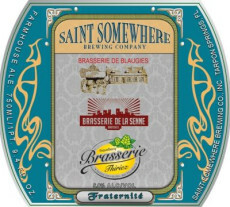 In fact I’m really surprised that this came out of Saint Somewhere, I’ve never found their beers all that intriguing, but this has that signature elegance of the Thiriez yeast strain that I love so much.